Our first impressions of the Lumia 925 are immediately very positive, at least from a hardware perspective. The phone appears to be Nokia's direct response to criticism of the previous Lumia 920, which we found a little too thick and heavy despite its fantastic camera. The Lumia 925 is thinner and lighter than its predecessor and is the first Lumia device to use an aluminum frame. The Lumia 925 is thinner and lighter than its predecessor and is comfortable to hold. At 139g, the Lumia 925 is almost 50g lighter than the Lumia 920 and it's just 8.5mm thick compared to 10.7mm. Although the frame is aluminium, the back of the phone is a polycarbonate piece that is available in black, white or grey colour variants. As you can see from the photo above, our review unit is the all black model. The back of the Lumia 925 has a slight bump surrounding the camera lens. The phone is far more comfortable to hold and use than its predecessor, largely thanks to the smooth, rounded edges and the subtle, rounded corners. The side mounted lock screen and volume buttons are also well positioned for one-handed use, and the camera shutter key offers better tactility than its predecessor. It's a great addition and something we wish more smartphone manufacturers would try and include. The back of the Lumia 925 has a slight bump surrounding the camera lens. The Lumia 925's display now uses OLED technology rather than the Lumia 920's IPS panel, but it's the same 4.5in size and 1280x768 resolution. Despite the resolution not being full HD, the screen is excellent. It offers good colour reproduction, above average viewing angles, and performs very well in direct sunlight. It's also very responsive to touch. Using the Lumia 925 is a similar, almost identical experience to most other Windows Phones and that is a real positive. The software is fast, there's very minimal lag, and we haven't had any apps crash or freeze so far. Scrolling, especially in the Internet Explorer browser, is smoother and faster than nearly all Android phones we've used. It's a familiar experience overall, but a very polished one. The Windows Phone 8 ecosystem might lack many third party apps but it does have some excellent and often overlooked core features. The 7GB of free SkyDrive cloud storage for free, and the built-in Microsoft Office app are two of the best, while Nokia's pre-loaded apps include the excellent Here Maps and Here Drive. The latter provides free turn-by-turn navigation out of the box, with the ability to download maps. Scrolling in the Internet Explorer browser is smoother and faster than nearly all Android phones we've used. The Lumia 925 has the same 8.7-megapixel camera with optical image stabilisation as its predecessor. However, it is the first Nokia phone to come preloaded with the company's Smart Camera app. It's a capture and edit tool that introduces three new features: Best Shot, Action Shot and Motion Focus. We haven't had long enough with the device to check it out extensively yet but the Action Shot feature, which highlights motion and brings together each picture in the series, looks promising. There are a couple of minor design points about the Lumia 925 that we don't like. Firstly, the gap between the polycarbonate back piece and the aluminium frame is clearly visible and detracts from the overall look and feel. Secondly, while it will ultimately be a personal preference, we much prefer the white and grey variants to the our all-black review unit. The black model does little to stand out, even if it does look sleek, though we may have been spoiled by Nokia's usual vibrant colour choices. The gap between the polycarbonate back piece and the aluminium frame is clearly visible. A minor complaint is that text can often appear jagged in the Internet Explorer browser, so you'll need to get used to zooming in on large blocks of text when surfing the Web. That's the only real criticism of the Lumia 925's display, and it's a minor one. One of the biggest issues with the Nokia Lumia 925 and more importantly the Windows Phone OS itself, is the lack of popular third-party apps. A visit to the Microsoft App Store will quickly tell you all you need to know but many apps we use on a daily basis on iOS and Android simply aren't available on Windows Phone. A few examples include Dropbox, Pocket, Instagram, Pinterest, Flipboard, Snapchat and Any.Do. The lack of quality third-party apps is an issue that we suspect will prevent most average consumers switching from iOS or Android to a Windows Phone. 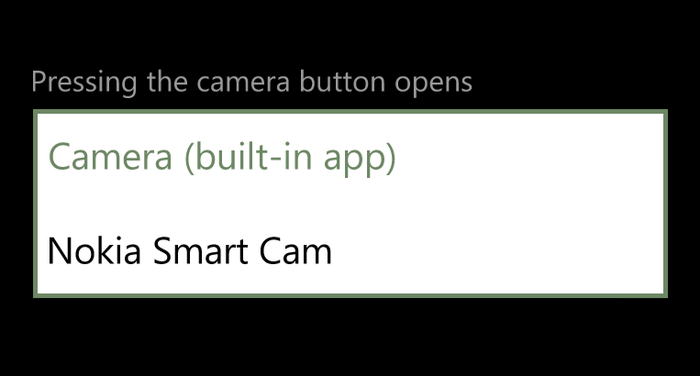 Nokia's Smart Cam app can be set as the default camera application. Disappointingly, the Lumia 925 only has 16GB of internal memory compared with the 32GB of its predecessor. With no microSD card slot, this could be a turnoff for some users, though the 7GB of Skydrive cloud storage that comes with every Windows Phone is a nice touch and could be enough to overlook expandable memory for some users. Finally, the Lumia 925 is capable of wireless charging, but only with an optional wireless charging cover which clips to the back of the phone. The Lumia 920 had this feature natively. The wireless charging cover is available in black, red, white and yellow colours, though Nokia hasn't announced Australian pricing for the accessory just yet. There's a camera shutter key, but no microSD card slot on the Lumia 925. The Nokia Lumia 925 will be available through Telstra from Tuesday, 30 July, and Optus from Thursday, 1 August, and also retails for $699 outright through various retails. We'll be publishing a full review of the Lumia 925 in the coming days. In the meantime, if you have any questions or comments, please let us know below!